"Oh! Such cannonading on all sides, such shrieks and groans, such commotion of all kinds!" wrote the teenaged Sue Chancellor, a Virginia planter's daughter, in May 1863. "We thought that we were frightened before, but this was far beyond everything. . . . Oh, the horror of that day!" Sue's reactions to the Civil War around her was only one of myriad responses to the conflict from children—boys or girls, black or white, slave or free, rich or poor. They experienced the war differently from adults, and their experiences were by no means uniform. In Topsy-Turvy, Anya Jabour brings into sharp relief the way in which gender, race, slavery, and status shaped the lives of children in the American South before, during, and after the Civil War. She argues persuasively that the identities children developed in the antebellum era shaped their responses to the upheavals of the war years and their lives after the war's conclusion. 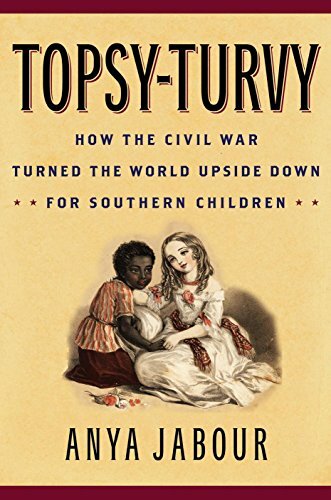 Even as Topsy-Turvy presents the Civil War as a major turning point in Southern children's lives, it also illuminates the interplay between continuity and change in the history of the American South. Because the war was fought largely on Southern soil, parts of the region became a "permanent landscape of war," and children in the Confederacy thus experienced the struggle in an especially profound and personal way. Deeply researched, abundantly illustrated, and engagingly written, the book is a major contribution to Southern history. With twenty-eight black-and-white illustrations. Anya Jabour is professor of history and co-director of women's and gender studies at the University of Montana, Missoula. She has also written Marriage in the Early Republic, Major Problems in the History of American Families and Children, and Scarlett's Sisters: Young Women in the Old South. She lives in Missoula, MT.